How to Choose the Right Hospital Gown? Still Not Sure Which Hospital Gown is the Best? are protective barriers, which provide full body protection to both the patient and medical professionals. A hospital gown is an essential component required within the medical field, especially in surgery (usually referred to as a surgical gown), to help prevent contamination, and be a barrier against infections and viruses. Hospital gowns are especially good as they are both liquid repellent and liquid tight. Such gowns can also be found in other industries such as laboratories, and the food industry, where protection from contaminants is required. 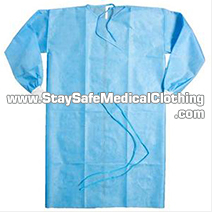 For medical professionals surgical gowns provide general protection and protection against bodily fluids, any other liquids, and chemicals used within surgery. Similarly, the gown protects patients from any bacteria, and contaminants from the medical professionals within an operating room. The hospital gowns are also designed for staff to easily access the necessary parts of a patient’s body. Both sterile and non-sterile gowns are available, which come in sleeveless, short sleeves, and long sleeves, to accommodate for both surgery, and outside surgery needs. The gowns are also available in reinforced weight, which adds extra protection in the form of a double layer around the chest and arms. As well as this, they are breathable garments, which are flexible, yet strong, and are also disposable making them environmentally friendly. 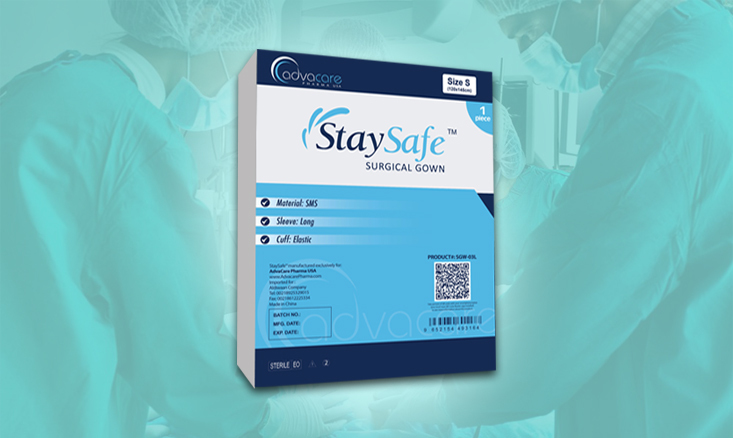 StaySafe™ surgical gowns also come in a range of sizes, colors, and elastic and knitted cuffs to suit all preferences and requirements of our distributors and final users. 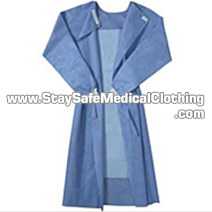 Can StaySafe™ surgical gowns be reused? No, these are designed to be disposable, especially after being in surgery, to prevent cross-contamination from person to person, and spreading any contaminants outside. When would it be appropriate to use the short sleeve or sleeveless gowns? These should only be used by the medical professionals when visiting patients outside of surgery. Patients can also use these gowns at all times whether in or out of surgery. It is when a gown has a double layer around the chest and arms, to provide an additional barrier. 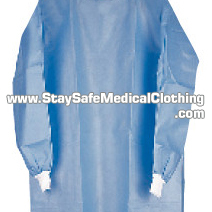 Several layers of protection allow for better gown performance. PP material stands for polypropylene, it is an excellent barrier against water, and is also highly chemical resistance. SMS material stands for spunbond+meltblown+spunbond, it is a 3 layer nonwoven material which provides strength, has a bacterial layer, and also acts as a repellent. The increased layers increase the barrier and protection within the work environment. Which material is better to use? Different materials provide different levels of protection, and/or protection from different elements. The choice of material should be based on individual requirements, the likely contaminants one is exposed to, and the body area likely to be exposed to contaminants and/or bodily fluids. Are the PE reinforced materials better? The reinforced materials tend to combine advantages of both materials, and so are suitable where more than one element in a working environment needs to be considered. They provide a second barrier and additional strength, but this is not always necessary, so is down to preference/needs. Do you have more questions about our Hospital Gowns? Contact Us!